Spring is the perfect time to start thinking about pest control when the weather is starting to warm up and spring rains bring lush new foliage growth which inevitably brings pests and disease soon after. Pest insects and mites love to munch on the tasty new shoots, be it your prize roses, veggie garden or beautiful lush hedge and this can result in poor plant performance, unsightly foliage damage or in some cases death of the plant. Because of this it is important to manage pest levels in the garden well before they get to infestation stage and conventional methods require good timing and chemical sprays to do this. Another method is integrated pest management, which in the long term, is a much simpler solution to pest management. Integrated Pest Management (IPM) is a term that gets thrown around loosely in the industry and in short means observing and managing pest levels to a low level of damage in the garden (or crop) and not allowing pests to get past low colonisation levels. Good IPM practices rely on low toxicity pesticides and the colonisation of beneficial insects in the garden to prey on the pest species. This spring we are trialling the use of predatory insects as pest control in gardens using a cross section of beneficial predatory insects sourced from Bugs for Bugs. Included in the mix were lady bugs and lace wings which are both general feeders and a bit of a garden power house when it comes to aphids and the like. 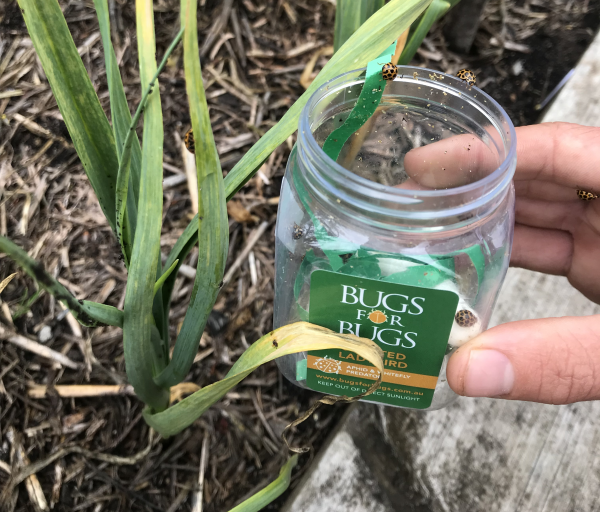 These guys were released throughout the ornamental and veggie gardens, particularly in areas where we already had low level aphid populations. We have high hopes that they will colonise throughout the garden and become hard working occupants. Specific predatory mites were released in mite prone shrubs, particularly topiary Buxus balls and hedged Portuguese Laurel, which will hopefully keep any burgeoning pest population in check before a damaging infestation takes place. Once mite damage occurs on the leaf it wont repair and will remained silvered and unsightly which is a major concern in many important horticultural garden features such as hedges and topiary. All in all, our hope for this trial is that the predators take hold in the garden and keep the pest insects and mites in check which will help us reduce the chemical load in gardens and reduce the need for instant and ongoing action in response to an infestation- The bottom line is a potential reduction in time and money spent on spraying gardens for pests and disease.